Roasted Asparagus Parmesan is the quickest and most delicious asparagus ever! Drizzle with olive oil and sprinkle with kosher salt and fresh ground pepper. Sprinkle with freshly grated Parmesan cheese and return to oven for a minute so that cheese melts. 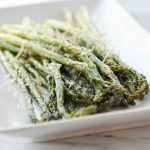 Roasted Asparagus Parmesan was originally written by Leigh Anne Wilkes at https://www.yourhomebasedmom.com/roasted-parmesan-asparagus/.